Fun street art along Fenton Parkway! – Cool San Diego Sights! Fun street art along Fenton Parkway! 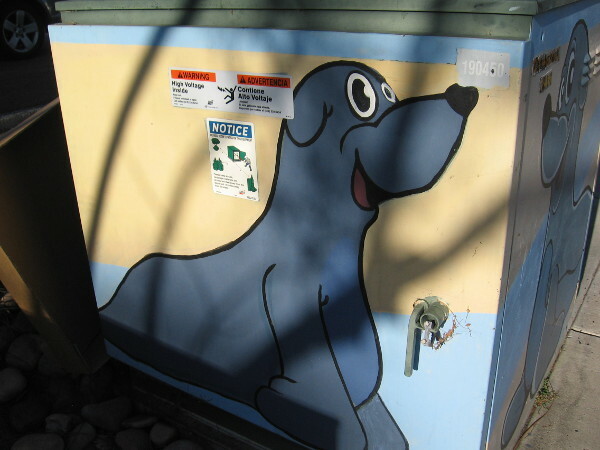 A sea lion greets people who walk down the sidewalk. Humorous street art on Fenton Parkway. 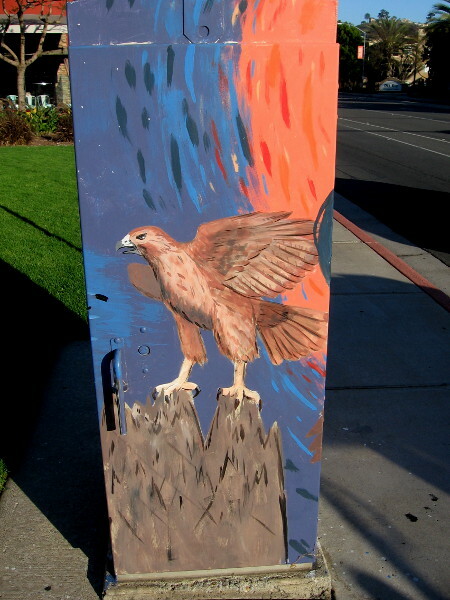 I’ve noticed an increase in the amount of street art along Fenton Parkway in Mission Valley. 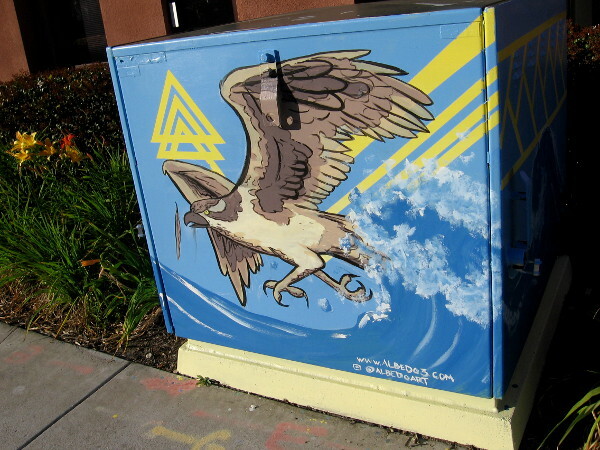 A variety of electrical boxes have been painted, and others appear to be works in progress. 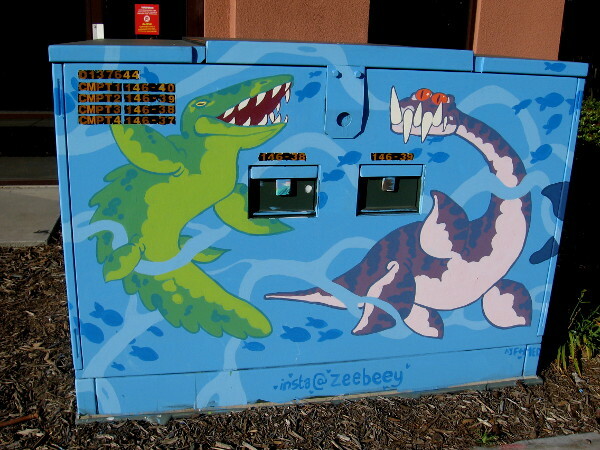 There’s so much fun street art now, I figured I’d post some photos! These photographs were taken late today during a short walk between the trolley tracks and Friars Road. 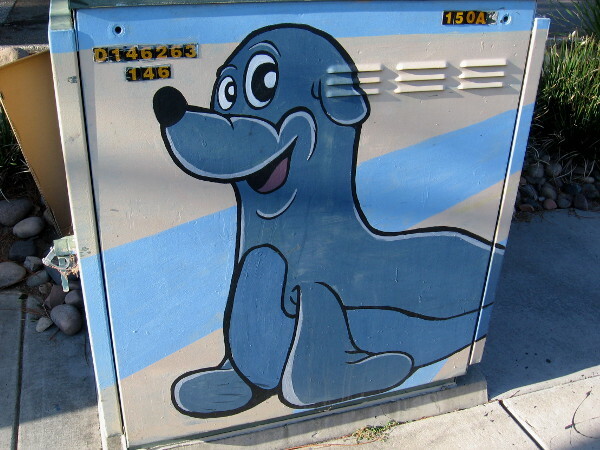 Another side of the same box, and another happy sea lion! This box appears to be a work in progress. 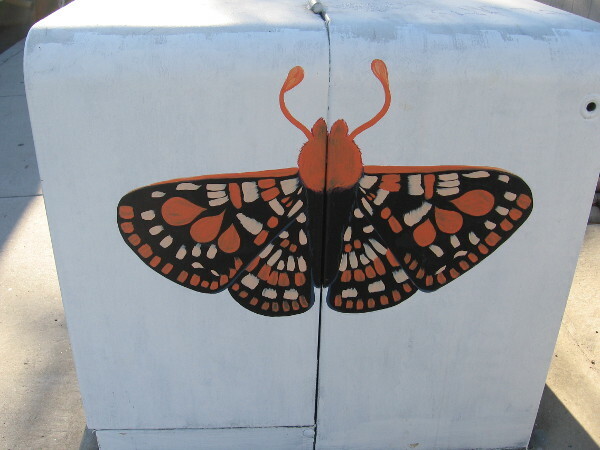 One side has an elaborate moth completed. 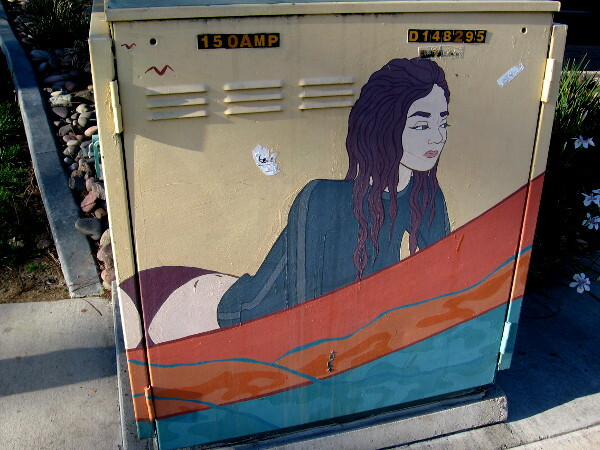 Surfer girl street art on another electrical box. She’s on her surfboard awaiting a perfect wave. A girl and dog overlooking the ocean at sunset. 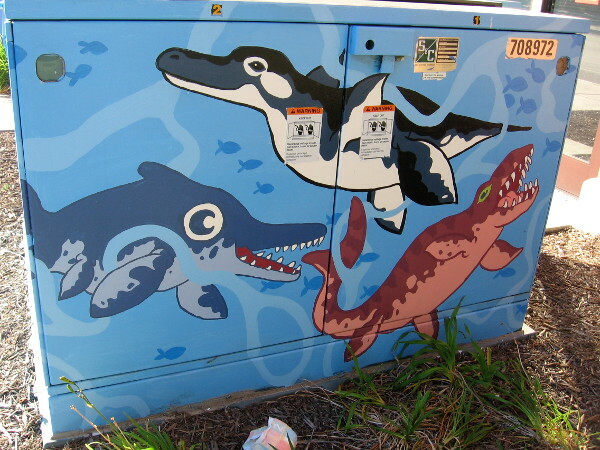 The ocean in this street art seems to be populated by all sorts of odd prehistoric creatures! This fun scene was created by imaginative art teacher Anna Farrell. 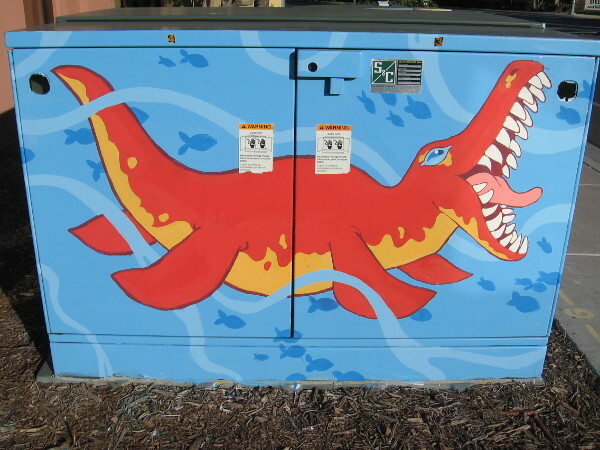 Another colorful side and another toothy monster. 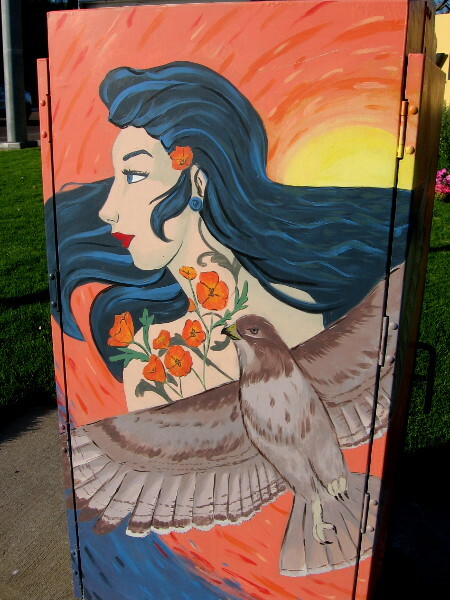 A cool bird of prey painted by artist Rachel Dipasupil Alberto. I believe it might be an osprey. 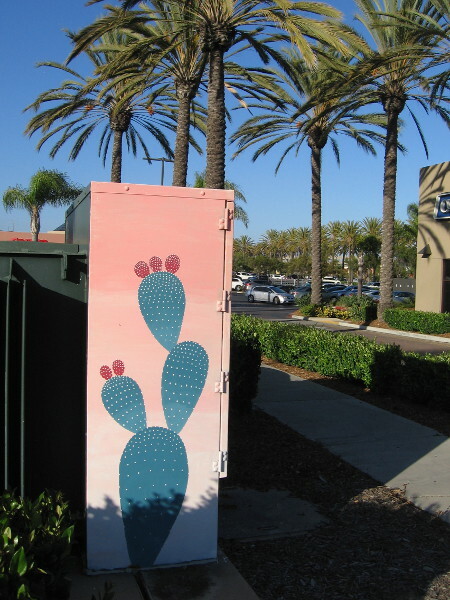 These prickly pears seem to be growing beneath the nearby shopping mall’s palm trees! A very cool eagle or hawk near the intersection of Fenton Parkway and Friars Road. A stunning image on another side of the same box. Thousands of motorists enjoy seeing this beautiful artwork as they drive east down busy Friars Road. 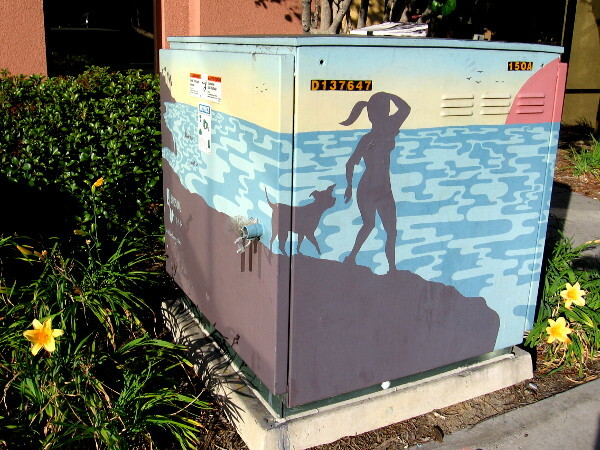 Pingback: Cool street art memories for a rainy day. – Cool San Diego Sights! Previous Previous post: Many caring, animal loving volunteers needed! Next Next post: Cool sights observed during several walks.